Boy, that Droughtlander seemed to last forever, didn’t it? Do I even still remember how to use WordPress? Whew, it seems I do. But, at last, our long international nightmare is over and Outlander is back with season 3 and we have our first (and only) bit of Gàidhlig for the episode. It just had to happen at one of the most tear jerking parts of the episode, right? Luckily it’s not even a phrase I had to look up, as I often use a form of it to close my travel blogs. Starz posted the following on Twitter and Facebook today. I thought it was worth a separate blog post since it is a cool new on set picture of Àdhamh working! I believe that is Rupert with whom he appears to be going over dialog. This picture is also another confirmation that Outlander isn’t going to be a ‘clean’ version of the 18th century. Just look at all that strategically placed dirt! 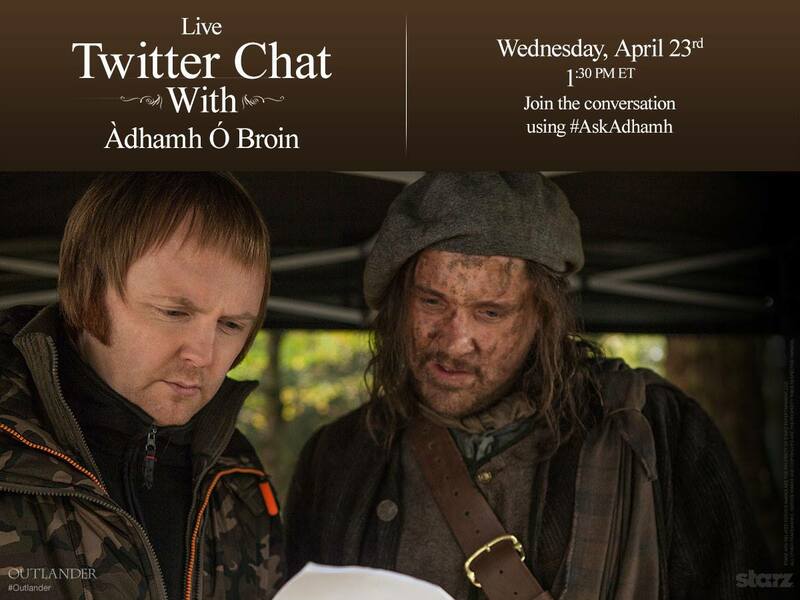 It sounds like the Q&A will be conducted over the @Outlander_Starz Twitter account and not Adhamh’s personal account (@an_comhghallach). Also, be sure to send use the hashtag #AskAdhamh when participating.